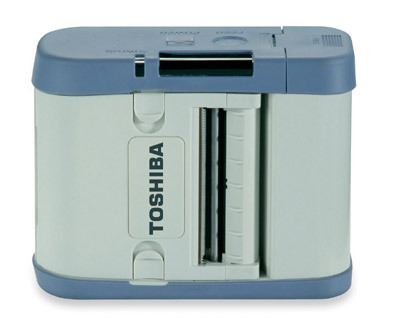 The portable Toshiba Tec B-SP2D, compact, lightweight and versatile for wireless printing applications. This 2" portable printer from TOSHIBA TEC has an ultra-compact, high performance design that makes it ideal for producing quality barcode labels as and where you need them. Perfect for price markdown labelling on shop floors, doorstep delivery receipts, tracking parcels in warehouses, printing tickets for events... the possibilities are endless! Printing speed: up to 80 mm/s. Based on its hugely successful predecessor the B-211, used in major portable applications the world over, the Toshiba Tec B-SP2D is completely compatible with B-211 software and supplies. It can communicate with pocket PCs or other mobile and static devices at an amazing six times faster than the B-211, either via its serial, infra-red or Bluetooth interfaces. Labels and receipts up to half a metre in length can be issued either in batch or peel-off modes. Loading the labels in either mode is only a matter of ‘drop and close' thanks to the removable peel roller. A re-issue button allows for the last label to be reprinted. A built in head check funciton checks for faults in the thermal head. Use of flash memory allows up to 20 label formats and a graphic/logo to be stored on the printer. Print up to 2" wide x 6.3" long labels in batch mode or as small as 1.34" wide x .28" long. Print a minimum of 600 1.73" long labels on a single battery charge.